Lasiocarpine and riddelliine are pyrrolizidine alkaloids (PAs) known to cause liver toxicity. The aim of this study was to predict the inter-species and inter-ethnic human differences in acute liver toxicity of lasiocarpine and riddelliine using physiologically based kinetic (PBK) modelling based reverse dosimetry of in vitro toxicity data. The concentration–response curves of in vitro cytotoxicity of lasiocarpine and riddelliine defined in pooled human hepatocytes were translated to in vivo dose–response curves by PBK models developed using kinetic data obtained from incubations with pooled tissue fractions from Chinese and Caucasian individuals, providing PBK models for the average Chinese and average Caucasian, respectively. From the predicted in vivo dose–response curves, the benchmark dose lower and upper confidence limits for 5% effect (BMDL5 and BMDU5) were derived and subsequently compared to those previously obtained in rat to evaluate inter-species differences. The inter-species differences amounted to 2.0-fold for lasiocarpine and 8.2-fold for riddelliine with humans being more sensitive than rats. The inter-ethnic human differences varied 2.0-fold for lasiocarpine and 5.0-fold for riddelliine with the average Caucasian being more sensitive than the average Chinese. In conclusion, the present study provides the proof-of-principle to predict inter-species and inter-ethnic differences in in vivo liver toxicity for PAs by an alternative testing strategy integrating in vitro cytotoxicity data with PBK modelling-based reverse dosimetry. The online version of this article ( https://doi.org/10.1007/s00204-019-02397-7) contains supplementary material, which is available to authorized users. Lasiocarpine and riddelliine (Fig. 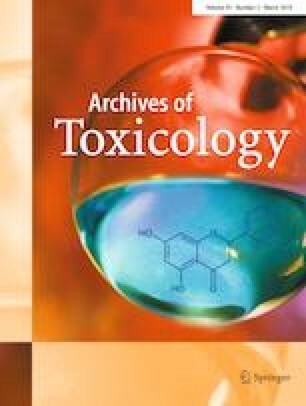 1) are chemicals belonging to the group of pyrrolizidine alkaloids (PAs) which are important secondary metabolites of approximately 6000 plant species distributed around the world (Smith and Culvenor 1981). Lasiocarpine is widely distributed in the Heliotropium and Symphytum genus (Boraginaceae species), and riddelliine is present in the genus Senecio (Asteraceae species) (Adams et al. 1942; Smith and Culvenor 1981). PA-containing plants can be toxic to livestock, wildlife and humans (Stegelmeier et al. 1999). Human exposure to lasiocarpine and riddelliine may result from the consumption of contaminated food staples, plant food supplements, herbal medicines, herbal teas, honey and milk (EFSA 2011, 2017). Exposure to lasiocarpine, as well as riddelliine has been shown to cause fatal liver veno-occlusive disease in animals and humans (Bane et al. 2012; Mohabbat et al. 1976; Tandon et al. 1978). A 2-year National Toxicology Program (NTP) study testing the genotoxicity and carcinogenicity of lasiocarpine and riddelliine showed that these PAs are also carcinogenic and genotoxic compounds (Chan et al. 2003; NTP 1978, 2003). Liver angiosarcomas were observed in 11 of 23 male rats and 7 of 24 female rats following dietary administration of 0.75 mg/kg bw/day of lasiocarpine. Riddelliine induced a high incidence of liver hemangiosarcoma in both male (43 out of 50 rats) and female rats (38 out of 50 rats) at 0.7 mg/kg bw/day (Chan et al. 2003; NTP 1978, 2003). The International Agency for Research on Cancer (IARC) classified these alkaloids in Group 2B, potentially carcinogenic to humans (IARC 2017). Following absorption in the gastrointestinal tract, PAs are distributed to the liver where the main metabolism occurs (Fu et al. 2004). In general, three metabolic pathways have been identified for lasiocarpine (heliotridine-type PA) and riddelliine (retronecine-type PA) (Fig. 1) (EFSA 2011; Fu et al. 2004). The bioactivation pathway is the conversion of lasiocarpine or riddelliine into a toxic intermediate, known as a dehydropyrrolizidine alkaloid, in a reaction mainly catalysed by cytochrome P450 3A4 (Fu et al. 2004). Dehydropyrrolizidine alkaloids react with cellular proteins and DNA leading to liver toxicity, genotoxicity and carcinogenicity (Fu et al. 2004). Other metabolic pathways include hydrolysis and N-oxidation, leading to the formation of necine bases and PA N-oxides, respectively (Fig. 1). These latter two metabolic pathways are considered to lead to detoxification (EFSA 2011). Significant variations between species regarding the toxicity of PAs have been observed. Recently, Fashe et al. (2015) conducted a comparative study on the metabolism of lasiocarpine by human and rat liver microsomes and found that humans might be more susceptible to lasiocarpine-induced toxicity, because the overall metabolic fingerprint detected upon incubation with human liver microsomes differed from that obtained with rat liver microsomes in the following two major aspects: (1) the amount of detoxified metabolites was lower in incubations with human liver microsomes than with rat liver microsomes, and (2) higher levels of GSH-reactive metabolites were formed in incubations with the human liver microsomes than with the rat liver microsomes. These species differences may be mediated by inter-species differences in biotransformation capacities including CYP 3A4 catalysed bioactivation, carboxylesterase-mediated hydrolysis and the level of cellular GSH (Fashe et al. 2015). In addition to these possible species differences in biotransformation capacities, other studies reported ethnic differences in P450 dependent metabolism and these may potentially result in inter-ethnic differences in PA bioactivation and detoxification. Yang et al. (2012) reported significant differences in phenacetin O-deethylation, diclofenac 4′-hydroxylation, (S)-mephenytoin 4′-hydroxylation, and chlorzoxazone 6-hydroxylation reactions, mediated by CYP 1A2, CYP 2C9, CYP 2C19 and CYP 2E1, respectively between Chinese and Caucasian liver microsomal preparations. Previously, we also reported differences between Chinese and Caucasians regarding the metabolic bioactivation and detoxification of the food-borne genotoxic carcinogen estragole, resulting in a predicted 4.5-fold lower formation of the ultimate carcinogenic metabolite of estragole with similar rates of detoxification in Chinese as compared to the Caucasians, and thus a possible lower risk of estragole exposure for the average Chinese at similar levels of exposure (Ning et al. 2017). Thus, inter-species and inter-ethnic human differences in metabolism might occur and may in theory also affect the sensitivity towards PA toxicity. The aim of this study was to predict the inter-species and inter-ethnic human differences in acute liver toxicity of lasiocarpine and riddelliine using physiologically based kinetic (PBK) modelling-based reverse dosimetry of in vitro toxicity data. Previously, we developed a PBK modelling-based approach to predict acute liver toxicity of lasiocarpine and riddelliine in rats (Chen et al. 2018). The predicted BMDL5–BMDU5 values for in vivo liver toxicity of lasiocarpine and riddelliine in rats amounted to 23.0–34.4 and 4.9–8.4 mg/kg bw/day, respectively (Chen et al. 2018). That study already showed that the PBK modelling-based approach was able to define inter-compound differences in acute liver toxicity of PAs. The study of Culvenor (1983) estimated that a dose of 0.7–3 mg/kg bw/day of riddelliine may lead to acute liver toxicity in humans, indicating that humans might be more sensitive than rats towards liver toxicity of PAs. In the present study we developed PBK models for lasiocarpine and riddelliine in different ethnic populations (Chinese and Caucasian) and used these models to convert in vitro toxicity data obtained in pooled human hepatocytes to predict in vivo dose–response data and BMDL5–BMDU5 values for acute liver toxicity of lasiocarpine and riddelliine in humans. Subsequently, these points of departure (PoDs) were compared to PoDs derived previously for rats by the same methodology (Chen et al. 2018) to evaluate the occurrence of species differences in the metabolism and toxicity of lasiocarpine and riddelliine while the PoDs obtained for the average Chinese and average Caucasian provided insight in inter-ethnic differences. Lasiocarpine (purity > 97%) was purchased from Phytolab (Vestenbergsgreuth, Germany). Riddelliine (purity > 90%) was a gift from RIKILT (Wageningen, The Netherlands) and from the National Institute for Environmental Health Sciences (NIEHS) (Durham, USA). The HepaRG cell line was obtained from Biopredic International (Saint-Grégoire, France). Cryopreserved pooled human hepatocytes (5 mixed gender donors), cryopreserved hepatocyte plating medium (CHPM) (CM 9000) and cryopreserved hepatocyte recovery medium (CHRM) (CM 7000) were purchased from Invitrogen (Cheshire, UK). Willliams medium E (without glutamine), penicillin/streptomycin-solution, L-glutamine, phosphate buffered saline (PBS), and trypsin–EDTA were purchased from Gibco (Paisley, Scotland, UK). Fetal bovine serum was purchased from the American Type Culture Collection (ATCC) (Manassas, USA). Dimethylsulfoxide (DMSO), human insulin and hydrocortisone-21-hemisuccinate were purchased from Sigma–Aldrich (Steinheim, Germany). Potassium dihydrogen phosphate, dipotassium hydrogen phosphate trihydrate, sodium phosphate, sodium chloride and trifluoroacetic acid (TFA) were purchased from VWR International (Darmstadt, Germany). Reduced nicotinamide adenine dinucleotide phosphate (NADPH) was obtained from Roche Diagnostics (Mannheim, Germany). Acetonitrile (UPLC/MS grade) was obtained from Biosolve BV (Valkenswaard, Netherlands). Human plasma and rapid equilibrium dialysis (RED) materials, including RED inserts, RED base plate and sealing tape were obtained from Thermo Fisher Scientific (Bleiswijk, the Netherlands). Pooled Caucasian liver microsomes (33 donors) were purchased from Corning (Woburn, MA, USA). Pooled Caucasian intestinal microsomes (15 donors) were obtained from Xenotech (Lenexa, USA). Pooled Caucasian human lung and kidney microsomes were purchased from Biopredic International (Rennes, France). Pooled Chinese liver microsomes (40 donors) were purchased from PrimeTox (Wuhan, China). The PBK modelling-based reverse dosimetry approach to predict the in vivo dose–response curves for risk assessment from in vitro cytotoxicity concentration–response data included the following steps: (1) establishment of in vitro cytotoxicity concentration–response curves for lasiocarpine and riddelliine in HepaRG cells and in cryopreserved pooled human hepatocytes from Caucasian donors and correcting for toxicity expected in hepatocytes from the Chinese population as described below in the “UPLC and LC–MS/MS analysis” section, (2) development of PBK models for lasiocarpine and riddelliine in human using the kinetic parameters defined in the present study using both Chinese and Caucasian human liver subcellular factions, (3) translation of in vitro concentration–response curves to the in vivo dose–response curves using the PBK models, (4) BMD analysis based on the predicted in vivo dose–response curves to obtain the BMDL5 and BMDU5 values as points of departure (PoDs), (5) comparison of the predicted PoDs in human (Chinese and Caucasian) to one another and to the previously predicted PoDs in rats (Chen et al. 2018) to assess for inter-ethnic and inter-species differences in acute liver toxicity. Two types of cells were used to determine the in vitro concentration–response curves for acute cytotoxicity in human liver including cells from the HepaRG cell line and human hepatocytes. The HepaRG cell line is a human hepatoma cell line, which can differentiate into hepatocyte-like morphology by treatment with DMSO (Kanebratt and Andersson 2008). HepaRG cells were seeded at a density of 9000 cells/well in 96-well plates in growth medium consisting of Williams’ medium E, supplemented with 10% fetal bovine serum (FCS), 100 IU/ml penicillin, 100 µg/ml streptomycin, 1% (v/v) L-glutamine, 5 µg/ml human insulin and 50 µM hydrocortisone-21-hemisuccinate. The medium was renewed every 2–3 days. After 2 weeks, the cells were nearly confluent and were cultured in the differentiation medium supplemented with 1.7% (v/v) DMSO. The medium was refreshed every 2–3 days. After 2 weeks differentiation treatment, HepaRG cells were fully differentiated and were used for experiments within 4 weeks with refreshing the medium every 2–3 days according to the protocol provided by Biopredic International. Cryopreserved mixed gender primary human hepatocytes from five Caucasian donors were also used to perform the cytotoxicity experiments and define in vitro concentration–response curves. Cryopreserved human hepatocytes were thawed according to the protocol provided by Invitrogen. Briefly, human hepatocytes were thawed in a 37 °C water bath and transferred to 50 ml thawing medium (CM 7000). The cells were centrifuged at room temperature at 100 g for 10 min and re-suspended in the plating medium (CM 9000). After determination of the cell viability using trypan blue exclusion, the cells were seeded in 96-well plates at a density of 50,000 cells/well and incubated in a 5% CO2: 95% air-humidified incubator for 6 h, after which the cells were ready to be exposed to the compounds. Only batches with a cell viability > 90% were used for experiments. Cytotoxicity was determined with the MTT assay by assessing the activity of mitochondrial dehydrogenase enzymes according to the method of Field et al. (2015). In brief, the fully differentiated HepaRG cells and human hepatocytes were exposed to serum-free medium containing different concentrations of lasiocarpine and riddelliine ranging from 4 to 300 µM (final concentrations), added from 200 times concentrated stock solutions in DMSO. Each concentration was measured in triplicate and three independent experiments were performed. A solvent control was included in each independent experiment. After 24 h exposure, MTT (0.45 mg/ml final concentration) was added and cells were incubated for another 2 h in the incubator. The formed MTT formazan crystals were dissolved in DMSO and the absorbance was measured at a microplate reader at 562 nm (SpectraMax M2, USA). All the data are presented as mean values ± SD. The half maximal inhibitory concentration (IC50) values used to assess the in vitro acute liver toxicity of lasiocarpine and riddelliine were obtained using GraphPad Prism 5.04 (GraphPad software, San Diego California U.S.A.) using a non-linear regression model for curve fitting Y = Bottom + (Top–Bottom)/(1 + 10^(X-LogIC50)). The in vitro concentration–response curve for liver toxicity for Chinese hepatocytes was obtained as described in the “UPLC and LC–MS/MS analysis” section. The in vitro incubations for the conversion of lasiocarpine with Chinese and Caucasian liver microsomes were performed as described by Fashe et al. (2015). Briefly, mixed gender human liver microsomes were incubated with lasiocarpine in the presence of NADPH. The incubation mixtures contained (final concentrations) 2 mM NADPH and 0.04 mg/ml microsomal protein in 0.1 M potassium phosphate (pH 7.4). After pre-incubation for 5 min, the reaction was started by adding NADPH. Incubations were performed for 30 min at substrate concentrations ranging from 3 to 200 µM (final concentrations) (added from 100 times concentrated stock solutions in DMSO), after which the reaction was terminated by adding ice-cold acetonitrile (20% v/v). Under these conditions conversion of lasiocarpine was linear in time (1–30 min) and with the amount of microsomal protein (0.01–0.04 mg/ml) (data not shown). Blank incubations were performed in the absence of the cofactor NADPH. The incubations for metabolism of riddelliine by human liver microsomes contained (final concentrations) 2 mM NADPH, 0.5 mg/ml microsomal protein for Chinese and Caucasian samples in 0.1 M potassium phosphate (pH 7.4) and 3 to 400 µM (final concentrations) riddelliine added from 100 times concentrated stock solutions in DMSO. After 5 min pre-incubation at 37 °C, the reactions were started by adding NADPH. Incubations were carried out for 30 min and the reaction was terminated by adding ice-cold acetonitrile (20% v/v). Under these conditions conversion of riddelliine was linear in time (1–30 min) and with the amount of microsomal protein (0.04–0.5 mg/ml) (data not shown). Blank incubations were performed in the absence of the cofactor NADPH. To compare the inter-ethnic differences in metabolic activation of lasiocarpine and riddelliine, incubations with Chinese and Caucasian liver microsomes were performed as described above in the presence of 20 mM glutathione (GSH) to scavenge dehydropyrrolizidine alkaloid metabolites. The level of GSH in the incubations was optimized to obtain the maximum scavenging of dehydropyrrolizidine alkaloid metabolites as major glutathione conjugate, namely 7-GS-DHP (Tamta et al. 2012), which was analyzed by LC–MS/MS analysis as described in the “UPLC and LC–MS/MS analysis” section. The kinetic constants for conversion of lasiocarpine and riddelliine by Caucasian intestinal, lung and kidney microsomal preparations were determined as described above for liver microsomes but increasing the incubation time to 2 h. Under these conditions conversion of lasiocarpine and riddelliine was linear with time (1–120 min) and with the amount of microsomal protein added (0.01–0.04 mg/ml for lasiocarpine, 0.04–0.5 mg/ml for riddelliine) for the intestine, whereas negligible conversion was observed for lung and kidney (data not shown). Before Ultra Performance Liquid Chromatography photodiode array analysis (UPLC-PDA) or LC–MS/MS analysis, all samples were centrifuged for 5 min at 15,000 g to precipitate microsomal proteins. Intestine, lung and kidney microsomes from the Chinese population are not available. However, the kinetic parameters obtained using pooled intestinal microsomal preparations from Caucasian individuals were used for the Chinese PBK model, because the results of the sensitivity analysis (see “Sensitivity analysis” section) revealed that the parameters related to the intestinal metabolism of lasiocarpine and riddelliine do not have a large influence on the predicted maximum concentration in the liver blood (Cmax). Because conversion by kidney and lung microsomes was negligible (see result section), no further kinetic data for these organs were required. The apparent maximum velocity (Vmax) and the apparent Michaelis–Menten constant (Km) were determined by fitting the data to this equation using GraphPad Prism version 5.04 (GraphPad software, San Diego California, USA). Vmax values expressed as nmol/min/(mg microsomal protein) were scaled to the Vmax expressed as µmol/h/kg bw using microsomal protein yields of 35 mg/g liver (Medinsky et al. 1994) and 20.6 mg/g small intestine (Cubitt et al. 2009), bodyweight and tissue fractions of human (Chinese and Caucasian). The Km values determined in vitro were assumed to be equal to in vivo Km values. To correct for protein binding in the in vivo situation in human liver blood, while the in vitro toxicity was determined in serum-free medium, the fraction of unbound lasiocarpine and riddelliine under the in vivo conditions (fub) was determined. To this end, the fub for both compounds in human blood was determined using the RED (rapid equilibrium dialysis) device. According to the protocol described by Waters et al. (2008), 300 µl of spiked human plasma containing 5 µM lasiocarpine and 5 or 50 µM riddelliine (final concentration, 1% v/v DMSO) were added to the plasma chambers of the RED device insert, while 500 µl dialysis buffer (PBS containing 100 mM sodium phosphate and 150 mM sodium chloride) were added to the buffer chamber. The device was sealed with tape and incubated at 37 °C on a shaker at 250 rpm for 5 h. After the system reached equilibrium, 50 µl of post-dialysis samples were collected from the plasma and buffer chambers into separate tubes. Subsequently, 50 µl of human plasma was added to the buffer samples and the same volume of dialysis buffer was added to the plasma samples, after which protein was precipitated by addition of ice-cold acetonitrile (75% v/v). After incubation on ice for 30 min, the mixtures were centrifuged at 15,000 g for 15 min at 4 °C, and the supernatants were analyzed by UPLC-PDA. The measurements were performed in three independent experiments. where fub is the fraction of the unbound lasiocarpine and riddelliine in human blood and Cub, in vitro is the unbound concentration of lasiocarpine and riddelliine in the in vitro culture medium. Since the exposure medium for the HepaRG and human hepatocyte cell lines was serum free, the concentrations of lasiocarpine and riddelliine in the in vitro cytotoxicity assay were considered to be the unbound concentration. This correction implies that the unbound fraction in vitro is set equal to the unbound fraction in vivo. The supernatant of each sample was analyzed on UPLC using a BEH C18 (1.7 µm 2.1 × 50 mm) column with a guard column and a photodiode array (PDA) detector (Acquity, Waters). The flow rate was 0.6 ml/min and the mobile phase consisted of ultrapure water with 0.1% (v/v) TFA and acetonitrile. For the analysis of lasiocarpine, a gradient was applied from 0 to 50% acetonitrile in ultrapure water in 2 min, after which the percentage of acetonitrile was increased to 100% in 3 min and kept at this level for 2 min longer, after which the column was set back to the starting conditions. Under these conditions, lasiocarpine had a retention time of 1.9 min. For detection of riddelliine, a linear gradient from 0 to 50% acetonitrile in ultrapure water during 4 min was applied, followed by an increase to 100% acetonitrile in 1 min. This percentage was kept for 1 min to wash the column, after which the column was set back to the starting conditions. Under these conditions, riddelliine eluted at 1.8 min. Identification of lasiocarpine and riddelliine was achieved by comparison of the UV spectra and retention times of these compounds to those of reference compounds. Quantification of lasiocarpine and riddelliine was done by comparing the peak areas of these compounds at a wavelength of 220 nm to the calibration curve of the corresponding standard compounds. The major glutathione conjugate of lasiocarpine and riddelliine, 7-GS-DHP was analyzed and quantified by LC–MS/MS. LC–MS/MS analysis was performed on a Shimadzu Nexera XR LC-20AD SR UPLC system coupled with a Shimadzu LCMS-8040 mass spectrometer (Kyoto, Japan). The samples (1 µl) were loaded onto a reverse phase C18 column (1.7 µm 2.1 × 50 mm) with a flow rate of 0.3 ml/min. The column temperature was set to 40 °C. The mobile phase consisted of ultrapure water with 0.1% (v/v) formic acid and acetonitrile containing 0.1% (v/v) formic acid. The gradient began with 0% acetonitrile for one minute to wash away unwanted salts, followed by a linear gradient from 0 to 5% in 8 min and a further increase to 100% in 6 min. This percentage was kept for 0.5 min, after which the column was set back to the starting conditions. A Shimadzu LCMS-8040 triple quadrupole with electrospray ionization (ESI) interface was used to perform the MS–MS analysis. The instrument was operated in positive mode in the multiple reaction monitoring (MRM) mode with a spray voltage of 4.5 KV. The 7-GS-DHP was monitored at the [M + H]+ of precursor to product 443.2 → 425.15 (CE = − 7 kV), 443.2 → 118.1 (CE = − 24 kV) and 443.2 → 247.2 (CE = − 15 kV) m/z. Some of these MRMs were also used in the study of Tamta et al. (2012). Under these conditions, 7-GS-DHP eluted at 8.97 min and the chromatogram of 7-GS-DHP is presented in the supplementary materials 1. The peak area of the total ion chromatogram (TIC) of 7-GS-DHP was acquired using Postrun analysis in the software LabSolution (Shimadzu). The ratio of the peak areas of 7-GS-DHP formed in incubations with Chinese and Caucasian liver microsomes at each substrate concentration, was assumed to reflect the inter-ethnic differences in metabolic activation of lasiocarpine and riddelliine. Thus, these ratios were used to convert the concentration–response curve for in vitro toxicity obtained with human hepatocytes derived from Caucasian donors to a curve for Chinese donors. To this end, the percentage of cytotoxicity at each concentration was multiplied by the amount of 7-GS-DHP formed in incubations with Caucasian liver samples divided by the amount formed in similar incubations with Chinese liver microsomes. This provided an estimated concentration–response curve for cytotoxicity towards Chinese liver hepatocytes. PBK models for lasiocarpine and riddelliine for the average Chinese and average Caucasian were developed based on the PBK models previously defined and evaluated by Chen et al. (2018) for lasiocarpine and riddelliine in rats. The structure of the model for lasiocarpine and riddelliine is presented in Fig. 2. The model has 7 compartments including blood, fat, rapidly perfused tissue, slowly perfused tissue, liver and intestine that are mutually connected through the systemic circulation which is represented by a blood compartment. The intestine and liver compartments are included in the model, since the conversion of lasiocarpine and riddelliine occurs in these organs. The physiological parameters for the average Chinese and average Caucasian were derived from the literature (Brown et al. 1997; NHFPC 2007, 2014) and are presented in Table S2 in the supplementary materials 2. Several reports from the literature indicate that Chinese have significantly smaller livers than Caucasians (Chan et al. 2006; Shi et al. 2009; Yuan et al. 2008). The physiological parameters provided by the National Health Commission of the People’s Republic of China (NHFPC) also show that the Chinese liver volume is 1.3-fold lower than the Caucasian liver volume. The tissue:blood partition coefficients were estimated from log Kow according to the method described by DeJongh et al. (1997). The log Kow values for lasiocarpine and riddelliine were estimated by ChemBio 3D 2010 software (CambrigeSoft, USA). Lasiocarpine and riddelliine were assumed to enter the body from the gastrointestinal tract lumen following first-order uptake. The in vivo oral absorption rate constant (Ka) of lasiocarpine and riddelliine in human were assumed to be the same as previously determined (Chen et al. 2018). The Ka obtained for lasiocarpine was 1.55/h and for riddelliine the value amounted to 0.72/h. Model equations were coded (supplementary materials 3) and numerically integrated in Berkeley Madonna 8.0.1 (Macey and Oster, UC Berkeley, CA, USA) using the Rosenbrock’s algorithm for stiff systems. where C is the initial value of the model output (Cmax in liver blood); C’ is the modified model output resulting from a 5% increase of the parameter value; P is the initial parameter value; P’ is the modified parameter value (Evans and Andersen 2000). A 5% increase in parameter values was chosen to analyze the effect of a change in parameter values on Cmax of lasiocarpine and riddelliine at a dose of 8 ng/kg bw/day and 3 mg/kg bw/day for 24 h exposure, representing respectively an average daily intake of PAs via consumption of herbal tea (Bfr 2013) and a dose level known to cause liver toxicity in humans (Culvenor 1983). Each parameter was analyzed individually while other parameters were kept at their initial value. The in vitro concentration–response curves on acute cytotoxicity were translated to in vivo dose–response curves on hepatotoxicity of lasiocarpine and riddelliine by PBK modelling-based reverse dosimetry. For this translation, each concentration applied in the cytotoxicity experiments was converted to a corresponding CLc/Rd, human blood which was then assumed to be the Cmax (the maximum concentration) of lasiocarpine and riddelliine in the liver blood and used as input in the PBK model to determine the corresponding oral dose which would result in acute hepatotoxicity. By performing this exercise for each concentration used in the in vitro cytotoxicity assay, the concentration–response curve was translated to an in vivo dose–response curve. The in vitro concentration–response curve on cytotoxicity of lasiocarpine and riddelliine for the average Chinese was obtained based on in vitro concentration–response curves on cytotoxicity derived from mixed gender human (Caucasian) liver hepatocytes, correcting the curve for the differences in bioactivation between Chinese and Caucasians as explained above the “UPLC and LC–MS/MS analysis” section. This was done because mixed gender Chinese liver hepatocytes were not available. To this end, each concentration in the cytotoxicity experiment was first multiplied by the fold difference in the peak area of the major glutathione conjugate, 7-GS-DHP formed in liver microsomal incubations in the presence of GSH for Chinese and Caucasian samples. Subsequently, the corrected in vitro concentration–response curves for Chinese were translated to the in vivo dose–response curves based on the same approach as described above for Caucasians using the PBK model for the average Chinese. BMD modelling was applied on the predicted in vivo dose–response curves to derive the BMDL5–BMDU5 (lower–upper 90% confidence interval of the benchmark dose that gives a 5% response) for hepatotoxicity by the PROAST software version 38.9 developed by RIVM (the Dutch National Institute for Public Health and the Environment) (Slob 2002). This BMD modelling was performed using Exponential and Hill models for continuous data. Models were selected if they passed the goodness-of-fit test at P = 0.05 and the ratio of the BMD5 and BMDL5 was not more than threefold (EPA 2017). Figure 3 shows the concentration–response curves for the cytotoxicity of lasiocarpine and riddelliine in HepaRG cells and human pooled hepatocytes from Caucasian donors. Table 1 shows the IC50 values derived from these concentration–response curves. The IC50 for the cytotoxicity of lasiocarpine and riddelliine towards rat hepatocytes reported in the previous study of Chen et al. (2018) are also shown in Table 1 for comparison. The results show that rat hepatocytes are more sensitive to lasiocarpine and riddelliine than the HepaRG and human hepatocytes, with the IC50 of lasiocarpine in rat hepatocytes being 20- and 2-fold lower than the IC50 in HepaRG and human hepatocytes, respectively and the IC50 of riddelliine in rat hepatocytes being 22- and 7-fold lower than the IC50 for riddelliine in HepaRG and human hepatocytes, respectively. Therefore, the sensitivity towards the toxicity of lasiocarpine and riddelliine decreases in the order: rat hepatocytes > human hepatocytes > HepaRG cells. 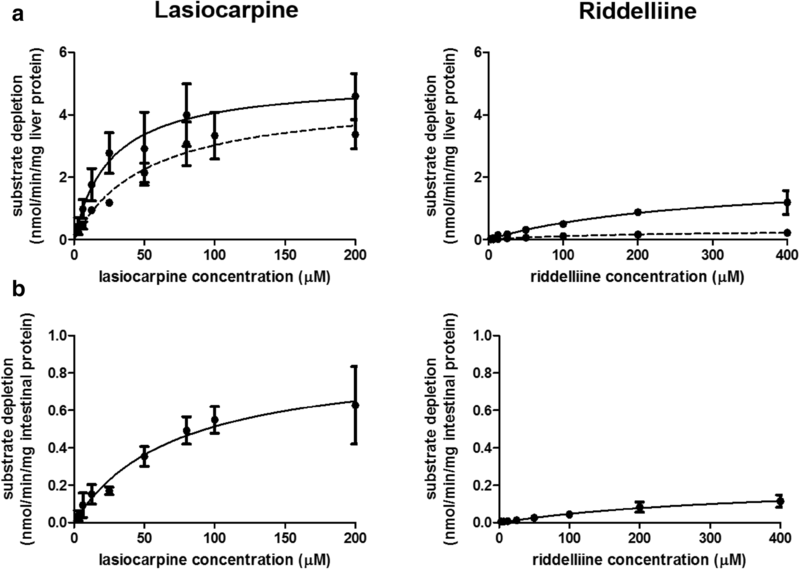 In the different cell models the cytotoxicity of lasiocarpine and riddelliine is comparable. For HepaRG cells the IC50 of lasiocarpine is 1.7-fold higher than that of riddelliine while for human hepatocytes, the IC50 of lasiocarpine is 2.1-fold lower than that of riddelliine. Chen et al. (2018) already reported that the IC50 of lasiocarpine was 1.8-fold higher than that of riddelliine in rat hepatocytes. Given that Chinese human liver hepatocytes are not available, the cytotoxicity of lasiocarpine and riddelliine towards Chinese liver hepatocytes was modelled based on the concentration–response curves obtained with mixed gender Caucasian liver hepatocytes, making a correction for the relative difference in bioactivation as determined in in vitro incubations. Figure 3 also shows the in vitro concentration–response curves of lasiocarpine and riddelliine for the Chinese population obtained in this way. From Fig. 3, the IC50 of lasiocarpine and riddelliine were derived for the average Chinese amounting to 126 ± 39 µM and 380 ± 67 µM, respectively. Comparing these IC50 values to the values obtained for the average Caucasian (Table 1), reveals that the IC50 values of lasiocarpine and riddelliine for the Chinese are estimated to be 6.0-fold and 8.6-fold higher, respectively. The cytotoxicity data are presented in the supplementary materials 4. Upon incubation of increasing concentrations of lasiocarpine and riddelliine with Chinese and Caucasian tissue fractions and NADPH, the extent of substrate depletion was quantified by UPLC-PDA analysis. Table 2 displays the apparent Vmax and Km values obtained from the plots as shown in Fig. 4 and the catalytic efficiency, calculated as Vmax/Km. Conversion of lasiocarpine and riddelliine was detected in incubations with liver and intestinal microsomes. Incubations of lasiocarpine and riddelliine with lung and kidney microsomes of Caucasians did not result in detectable metabolic conversion. Lung and kidney microsomes from Chinese individuals were not available, but it was assumed that they would also not cause metabolic conversion of lasiocarpine and riddelliine. Liver was the major organ for lasiocarpine and riddelliine metabolism, as reflected by the fact that the catalytic efficiency for the depletion of lasiocarpine or riddelliine in incubations with pooled liver microsomes from Caucasian individuals is around 15-fold higher than the catalytic efficiency derived from incubations with intestinal microsomes. Comparison of the kinetic constants for lasiocarpine and riddelliine reveals that for depletion of lasiocarpine by Chinese liver fractions, the Vmax is 15.3-fold higher and the Km is 3.7-fold lower than for riddelliine, resulting in a 54.8-fold higher catalytic efficiency for lasiocarpine metabolism. For Caucasian liver samples, the Vmax and Km for depletion of lasiocarpine are 2.6-fold higher and 10.5-fold lower, respectively, than those of riddelliine, resulting in a 27.1-fold higher catalytic efficiency for depletion of lasiocarpine. In the case of the intestine, the apparent Vmax and Km for the depletion of lasiocarpine in incubations with small intestinal microsomes from Caucasians are 5.0-fold higher and 5.3-fold lower, respectively, than those of riddelliine. The catalytic efficiency for depletion of lasiocarpine in these intestinal incubations is 25-fold higher than for depletion of riddelliine. Comparison of the kinetic data for the depletion of lasiocarpine and riddelliine by liver fractions from the Chinese and Caucasians reveals that the catalytic efficiency for both compounds by the Chinese liver samples is 2.3–4.6-fold lower, which is mainly due to a 2.0-fold higher Km for depletion of lasiocarpine and 6.7-fold lower Vmax for depletion of riddelliine in Chinese liver. Comparison of the kinetic data for formation of 7-GS-DHP of both compounds by Chinese and Caucasian liver fractions, reveals that over the substrate concentration range used in incubations with Chinese liver microsomes bioactivation of lasiocarpine and riddelliine is 7.5-fold and 8.1-fold lower, respectively. Vmax values in these incubations were not quantified because for correction of the in vitro curves only the relative ratio in bioactivation were required. The curves of the concentration-dependent rate of formation of 7-GS-DHP of both compounds, expressed in peak area/min/mg liver protein and the ratio of the peak areas of 7-GS-DHP formed in incubations with Chinese and Caucasian liver microsomes at each substrate concentration are presented in the supplementary materials 5. Since the 7-GS-DHP metabolite formed from lasiocarpine and riddelliine is the same, also bioactivation of the two compounds can be compared based on peak areas. In a subsequent step the kinetic constants presented in Table 2 were scaled to human tissues. To this end, the in vitro Vmax values expressed as nmol/min/mg microsomal protein (Table 2) were scaled to µmol/h/kg bw using the microsomal protein yields of 35 mg/(g liver) or 20.6 mg/(g small intestine) as scaling factors as described previously (Cubitt et al. 2009; Medinsky et al. 1994), bodyweight and tissue fractions of human (Chinese and Caucasian) and rat (Chen et al. 2018). This scaling allows the comparison of the kinetic constants obtained from tissue fractions of different species and from different organs. Table 3 presents a summary of the kinetic parameters for lasiocarpine and riddelliine by human (Chinese and Caucasian) tissue fractions thus obtained and the comparable kinetic parameter values previously reported for rat tissue fractions (Chen et al. 2018). 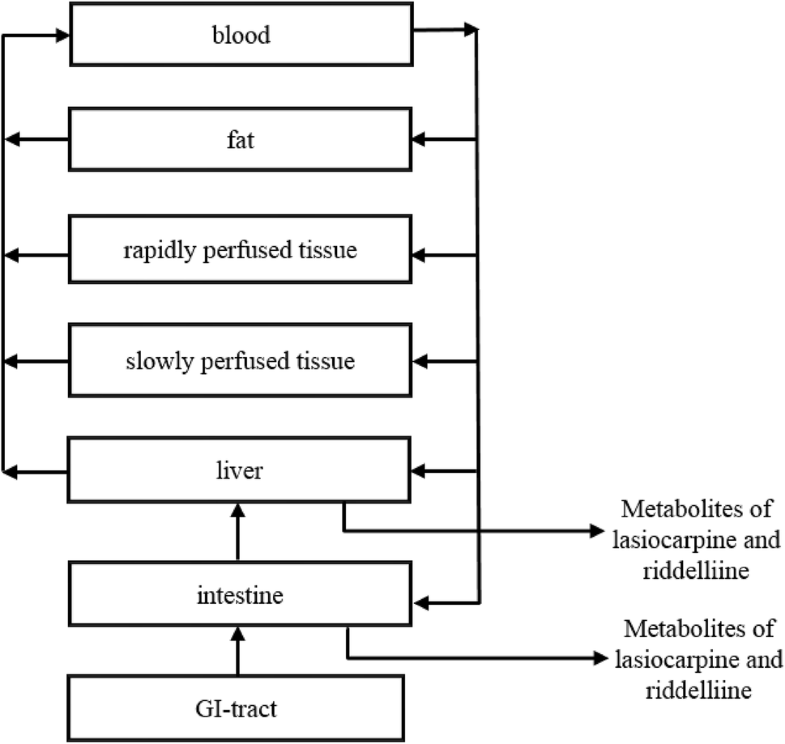 Comparison of the kinetic constants between human (Chinese and Caucasians) and rat shows that liver is the major organ for lasiocarpine and riddelliine metabolism. Compared to the human (Caucasian), the contribution of intestinal metabolism for both compounds is higher in the rat. The catalytic efficiency for the depletion of lasiocarpine is generally 3.2-fold lower in human liver (Chinese and Caucasian) and 6-fold lower in human intestine (Caucasian) than in rat. The overall catalytic efficiency for depletion of lasiocarpine in human (Caucasian) is 1.9-fold lower than in rat. The catalytic efficiency for the depletion of riddelliine is generally 16.8-fold lower in human liver (Chinese and Caucasian) and 1.2-fold lower in small intestine (Caucasian) compared to those values in rat tissues. The overall catalytic efficiency for depletion of riddelliine in human (Caucasian) is 5.0-fold lower. Those generally lower values of catalytic efficiency for depletion of lasiocarpine and riddelliine in human liver and small intestine compared to the rat were mainly due to relatively higher Km values for depletion of both compounds in human. The unbound fraction for lasiocarpine in human plasma was determined to be 0.43. For as yet unknown reasons, and in contrast to lasiocarpine, the unbound faction (fub) of riddelliine could not be detected after incubation in the RED device, even not when the concentration was increased from 5 to 50 µM. Previously, Chen et al. (2018) defined fub values for lasiocarpine and riddelliine by rat serum using the same method as provided in “Protein binding correction” section, and reported that the fub values of lasiocarpine and riddelliine in rat plasma were comparable, amounting to 0.64 for lasiocarpine and to 0.66 for riddelliine. Therefore, in the present study the fub of riddelliine in human plasma was assumed to be the same as the fub value of lasiocarpine in human plasma amounting to 0.43. To evaluate the performance of the human PBK models, ideally the model outcomes should be compared to available human data. Since such human in vivo data on the kinetics of lasiocarpine and riddelliine are not available, model evaluation is mainly based on evaluation of the same model in our previous study where we developed and evaluated the model for riddelliine and lasiocarpine in rat and mouse (Chen et al. 2018). Chen et al. (2018) described the performance of the rat and mouse PBK model of riddelliine by comparing the predicted Cmax of riddelliine in rat and mouse blood to the observed in vivo data reported in the literature (Chen et al. 2018). Data revealed that the predicted levels of Cmax of riddelliine in rat and mouse blood and the Cmax values observed in these species in the in vivo studies matched adequately (Chen et al. 2018). An additional evaluation of the model emerged from comparison of the PBK modelling-based predicted BMDL5–BMDU5 values derived from the predicted in vivo dose–response curve for liver toxicity of lasiocarpine in rats. The results fell well within the range of PoDs obtained from actual in vivo studies on acute liver toxicity of lasiocarpine in rats, indicating that the PoDs derived from the combined in vitro and in silico PBK modelling approach provided a good approximation of in vivo acute liver toxicity of lasiocarpine (Chen et al. 2018). Based on these results for the rat model, the developed PBK model for lasiocarpine or riddelliine are considered an adequate first approximation to describe the in vivo situation for human. An additional approach to describe the performance of the human PBK model for lasiocarpine and riddelliine for the human populations, especially for the difference between the Chinese and the Caucasian populations, was done based on the approach described previously (Ning et al. 2017). In this approach a comparison is made between the predicted inter-ethnic differences for the dose-dependent concentration of lasiocarpine and riddelliine in the liver blood and the observed inter-ethnic differences in hepatic metabolising enzymes that mainly catalyse the depletion of lasiocarpine or riddelliine. CYP 3A4 predominately catalyses the depletion of lasiocarpine and riddelliine in human liver (Fu et al. 2004; Miranda et al. 1991; Wiedenfeld and Edgar 2011). Figure 5 shows that at similar dose levels the predicted Cmax of lasiocarpine and riddelliine in the liver blood from average Chinese subjects is generally 2- to 3-fold higher than in the liver from average Caucasian subjects. This is mainly due to the fact that the catalytic efficiency for depletion of lasiocarpine and riddelliine by Chinese liver microsomes is 2- to 4-fold lower compared to Caucasian liver microsomes. The prediction of higher Cmax values for lasiocarpine and riddelliine for Chinese subjects is in line with the reported data for the Cmax and AUC of alprazolam, the substrate for CYP 3A4/5, for which the Cmax and AUC for Asian subjects (ten Chinese, three Filipino, and one Japanese) were 1.2- and 1.3-fold, respectively, higher than for Caucasian subjects (n = 14) (Lin et al. 1988). Furthermore, in a meta-analysis Barter et al. (2013) showed that the plasma clearance of the CYP 3A4/5 substrate midazolam following an oral dosing was 2.4-fold higher in Caucasian than in Chinese subjects. For the inter-species comparison, the predicted Cmax of lasiocarpine and riddelliine in the human (Chinese and Caucasian) liver blood is generally 2- to 5-fold higher than those in the rat liver blood as shown in Fig. 5. This is because the catalytic efficiency for depletion of both compounds in human (Caucasian) is 2- to 5-fold lower compared to rat. Altogether, the PBK models obtained in the present study were considered adequate for further prediction of the inter-species and inter-ethnic differences in hepatotoxicity of lasiocarpine and riddelliine. The normalized sensitivity coefficients of the model parameters for prediction of the Cmax of lasiocarpine and riddelliine in liver blood of Chinese and Caucasian was analyzed. The sensitivity coefficients were calculated at a dose of 8 ng/kg bw and 3 mg/kg bw lasiocarpine and riddelliine and all model parameters with sensitivity coefficients higher than |0.1| are shown in the supplementary materials 6. The results obtained reveal that for both Chinese and Caucasian subjects at a dose of 8 ng/kg bw lasiocarpine the predicted Cmax in liver blood in the PBK model is most sensitive to liver-related parameters and the absorption rate constant (Ka) for uptake from the GI tract. At 3 mg/kg bw lasiocarpine, the results of the sensitivity analysis of both ethnic groups are similar to the situation at 8 ng/kg bw lasiocarpine. The results for the sensitivity analysis of the PBK models for riddelliine shown in Figure S6 reveal similar results showing that Ka and liver-related parameters have the highest influence on the predicted Cmax of riddelliine in the liver blood in both ethnic groups. At 8 ng/kg bw riddelliine the results of the sensitivity analysis of both ethnic groups are similar to the analysis at 3 mg/kg bw. For both compounds, Ka and liver-related parameters have less influence on the predicted Cmax in the liver blood in average Chinese compared to average Caucasian. Figure 6 shows the predicted in vivo dose–response curves for liver toxicity of lasiocarpine and riddelliine in Chinese and Caucasian subjects obtained by translation of the in vitro concentration–response curves obtained from human hepatocytes (Fig. 3) by reverse dosimetry using the respective PBK models. The response % indicated at the y-axis of the in vivo dose–response curve was calculated based on Eq. (4): response % = 100% (solvent control)—cell viability % in the in vitro concentration–response curve. Table 4 presents the BMDL5–BMDU5 values derived from the predicted dose–response curves as shown in Fig. 6 for Chinese and Caucasian subjects. The values of the BMD5 (benchmark dose corresponding to 5% extra risk) were also presented to enable calculation of the ratios between the BMD5 and BMDL5 or BMDU5 showing they are generally lower than 3, which was one of the criteria for acceptance of the model fit. Detailed information on the BMD analysis can be found in the supplementary materials 7. Interestingly, the PBK modelling-based predictions for in vivo human toxicity of riddelliine could be evaluated using available human data, supporting further evaluation of the PBK models and the PBK modelling-based reverse dosimetry approach. The study of Culvenor (1983) estimated that in human subjects a dose of 1.4-3 mg/kg bw/day and 0.7–1.5 mg/kg bw/day of riddelliine may lead to liver necrosis (exposure of a boy for shorter than 2 weeks) and liver cirrhosis (exposure of a girl for 2 weeks), respectively (Culvenor 1983). The BMD5 values for Caucasian and Chinese subjects predicted in the present study are comparable since they amount to 0.5 and 2.6 mg/kg bw/day, respectively. For the inter-ethnic comparison, the predicted BMDL5 of lasiocarpine was observed to be 2.0-fold higher for Chinese than for Caucasian subjects and for riddelliine the predicted BMDL5 value was 5.0-fold higher for Chinese than for Caucasian subjects, indicating Chinese may be less sensitive to the liver toxicity of these PAs than the Caucasian population. This difference can be mainly ascribed to the lower relative level of bioactivation resulting in lower toxicity at similar dose levels in spite of the slower metabolic clearance. To obtain insight in possible species differences in sensitivity toward liver toxicity of the PAs, the BMDL5–BMDU5 values of lasiocarpine and riddelliine for acute liver toxicity for humans (Chinese and Caucasians) (Table 4) defined in the present study were compared to the same PoDs defined previously for rats using in vitro toxicity data in rat hepatocytes and PBK models for rats (Chen et al. 2018) (see Fig. 7). The BMDL5–BMDU5 values derived from the predicted dose–response curves for lasiocarpine for humans amounting to 11.1–32.3 mg/kg bw (average PoDs of Chinese and Caucasians) are up to 2.0-fold lower than the predicted BMDL5–BMDU5 values of Chen et al. (2018) for lasiocarpine for rat which amounted to 23.0–34.4 mg/kg bw/day. For riddelliine, the predicted BMDL5–BMDU5 values for humans amounting to 0.6–3.6 mg/kg bw (average PoDs of Chinese and Caucasians) are up to 8.2-fold lower than the BMDL5–BMDU5 for rat amounting to 4.9–8.4 mg/kg bw/day. Thus, humans seem to be somewhat more sensitive to liver toxicity of these PAs than rats. The aim of the present study was to use PBK modelling-based reverse dosimetry to translate human cytotoxicity data of lasiocarpine and riddelliine to in vivo dose–response data in humans (Chinese and Caucasians) and study ethnic human differences. Comparison of the results to a similar study previously performed for rats (Chen et al. 2018) would provide insight in species differences in sensitivity to these two PAs. The PBK model developed in the present study describes the kinetics of lasiocarpine and riddelliine and not of their metabolites, since we assume that the acute liver toxicity of lasiocarpine and riddelliine can be modelled based on cytotoxicity data of the parent compound provided that the in vitro model used contains the adequate enzymes required for their bioactivation to hepatotoxic metabolites. Especially the dehydropyrrolizidine alkaloid metabolites of PAs are reactive with proteins and DNA, thereby causing toxic effects (Fu et al. 2004). The in vitro cytotoxicity experiment using HepaRG cells and human hepatocytes can be expected to take this bioactivation into account. The HepaRG cell line is a human hepatoma cellular model consisting of a mixture of both hepatocyte-like and biliary-like cells (Lambert et al. 2009). After the treatment with DMSO, HepaRG cells differentiate into hepatocyte-like morphology. Kanebratt and Andersson (2008) reported that the expression of P450 in HepaRG cells was generally lower compared with human hepatocytes, except for a higher expression of CYP 3A4 and CYP 7A1. However, the CYP 3A4 activity was still about 1.5-fold higher in human hepatocytes in 2 out of 3 individuals compared to DMSO treated HepaRG cells as determined by measuring the clearance of the CYP 3A4 probe substrate midazolam (Kanebratt and Andersson 2008). Other studies also showed that P450 activities such as CYP 1A2, CYP 2B6, CYP 2C8, CYP 2C9, CYP 2C19 and CYP 2D6 were generally lower in HepaRG cells than in human hepatocytes, except for CYP 3A4 showing a generally 1.5-fold higher activity in HepaRG cells (Kvist et al. 2018; Lubberstedt et al. 2011). However, Gerets et al. (2012) reported that CYP 3A4 activity was about 17.0-fold lower in the HepaRG cells than in freshly isolated human hepatocytes from three different donors. This conflicting result may result from inter-individual variability in CYP 3A4 activity and/or from differences in the level of enzyme induction in the DMSO treated HepaRG cells. However, based on the limited difference in the cytotoxicity of riddelliine and lasiocarpine in primary hepatocytes and the HepaRG cells observed in the present study (Fig. 3), we conclude that the induction of the CYPs involved in bioactivation of these PAs in the HepRG cells was adequate. Gerets et al. (2012) also reported that cryopreserved primary human hepatocytes showed a 3-fold higher sensitivity for the detection of hepatotoxic compounds compared with HepaRG cells. In the present study, the IC50 value for lasiocarpine and riddelliine derived from HepaRG cells was 10- and 3-fold higher, respectively, than the IC50 derived from studies with human hepatocytes, probably reflecting the lower metabolic capacity of the HepaRG cells for bioactivation of the PAs. Given these differences, prediction of the acute liver toxicity of both PAs was based on the in vitro concentration–response curves obtained with human primary hepatocytes. Based on the sensitivity analysis, the predicted Cmax values of lasiocarpine and riddelliine in average Chinese and average Caucasians are highly affected by the absorption rate constant (Ka) for uptake from the GI tract and the kinetic constants for metabolic clearance of the parent compounds in the liver. Variability in the kinetic constants for metabolic clearance can result from the individual differences in the expression of CYP 3A4 which is the primary enzyme for metabolizing lasiocarpine and riddelliine in humans (Miranda et al. 1991). The literature reports that the abundance of CYP 3A4 in the liver varies significantly in individuals (Fu et al. 2004), and the inter-individual variation in the level of CYP 3A4 expression can vary up to 100-fold (Westlind-Johnsson et al. 2003). In addition to the kinetic constants, the Ka value also has a large influence on the model predictions. In the present study, the Ka values of lasiocarpine and riddelliine were 1.55/h and 0.72/h, respectively as reported by Chen et al. (2018). In the study of Chen et al. (2018), Ka values of both compounds were defined based on Papp values derived by two methods: Qikprop software (SchrÖdinger, trial version, Germany) and a QSAR method developed by Hou et al. (2004). The Papp values obtained from these two methods differ only 1.3-fold for lasiocarpine, but 4.5-fold for riddelliine (Chen et al. 2018). The large difference in Papp values for riddelliine may, therefore, largely affect PBK model-predicted internal concentrations and related predicted dose levels that cause acute toxicity. Previously, Chen et al. (2018) reported the predicted BMDL5–BMDU5 for riddelliine in rat amounting to 1.0–2.2 mg/kg bw/day when using the Ka (0.27/h) obtained by Qikprop software and to 3.3–14.6 mg/kg bw/day when using the Ka (1.17/h) obtained by the QSAR method of Hou et al. (2004). The PoDs for riddelliine obtained in rats when using the average Ka amount to 4.9–8.4 mg/kg bw/day (Chen et al. 2018). This outcome supports the outcome of the sensitivity analysis indicating that the Ka value has a large influence on the model predictions. This leads to the conclusion that further refinement of especially the Papp and resulting Ka value may improve the models and their predictions. However, given that the predicted BMD5 values for riddelliine in Chinese and Caucasian subjects amounting to 2.6 and 0.5 mg/kg bw/day, respectively are comparable to the literature reported in vivo data for human subjects amounting to 0.7–3 mg/kg bw/day (Culvenor 1983) when using the average Ka values, the use of the average Ka value for riddelliine seems a reasonable strategy. A recent study reported that the pyrrolizidine alkaloid monocrotaline (retronecine-type PA) is a high-affinity substrate of the organic cation transporter 1 (OCT1), a transporter mainly expressed in liver and involved in uptake of chemicals from blood into the hepatocytes. This study suggested that active transport mechanisms may be involved in the cellular uptake of pyrrolizidine alkaloids into the liver tissue (Tu et al. 2013). In the present study, we used log Kow to estimate the liver tissue:blood partition coefficients of lasiocarpine and riddelliine. In perfusion-limited PBK models, such as used in our study, an immediate partitioning between plasma and tissue is assumed, which is not dependent on chemical diffusion across cell membranes and/or active uptake processes. Therefore, we do not expect to underestimate hepatic concentrations in our models. Given that the sensitivity analysis revealed that the Cmax of lasiocarpine and riddelliine in liver blood were not highly affected by the liver tissue:blood partition coefficients (see supplementary materials 6), estimation of this kinetic parameter for uptake of lasiocarpine and riddelliine into liver tissue based on partitioning between plasma and tissue is unlikely to affect the outcomes to a significant extent. Given that the methods used in the present study and in the previous study (Chen et al. 2018) for predicting the in vivo liver toxicity of lasiocarpine and riddelliine in rat were similar, using species-specific primary hepatocytes and species-specific subcellular tissue fractions in similar in vitro incubations to define the species-specific metabolic clearance, using a similar PBK model structure, the model predictions also provide insight in species differences in acute liver toxicity of lasiocarpine and riddelliine. This inter-species comparison, revealed that the predicted BMDL5 for liver toxicity of lasiocarpine and riddelliine in humans (average PoDs of Chinese and Caucasians) is up to 2.0-fold and 8.2-fold lower, respectively, than that for rat, indicating that humans are somewhat more sensitive towards acute liver toxicity of lasiocarpine and riddelliine than rats. It is of interest to note that the in vitro cytotoxicity of these two compounds in human Caucasian hepatocytes was lower than in rat hepatocytes, and that the predicted higher toxicity in vivo thus results from inter-species differences in the kinetics. The kinetics showed a 1.9- and 5.0-fold slower clearance of lasiocarpine and riddelliine in humans (Caucasian) compared to rats. According to literature, the metabolism of PAs in rodents is mainly catalyzed by CYP 2B and CYP 3A subfamilies, while in humans, metabolism is mainly catalysed by CYP 3A4 (Li et al. 2011; Miranda et al. 1991). This observation is of interest when considering rat toxicity data for human risk assessment. Extrapolating rodent toxicity data to the human situation usually includes the use of a default uncertainty factor of 10 to account for species differences, consisting of a factor of 4.0 for kinetic and a factor of 2.5 for dynamic differences (WHO 1999). In the present study, the inter-species differences in acute liver toxicity of lasiocarpine and riddelliine fall well within the default factor of 10. Such a compound-specific uncertainty factor that could be smaller than the default value of 10 was also reported for aristolochic acid I for which in vitro-PBK model facilitated reverse dosimetry-based predicted PoDs differed about 1.8-fold between rat and human and about 1.9-fold between mouse and human (Abdullah et al. 2016). Also for the bioactivation of estragole the compound specific uncertainty factor for differences in kinetics between humans and rats was predicted to be 2-fold and thus smaller than the default factor of 4.0 for kinetic differences (Punt et al. 2009). Altogether, these results reveal that the in vitro-PBK modelling-based reverse dosimetry may provide a way forward to define compound specific uncertainty factors, also called compound specific adjustment factors (CSAFs), in risk assessment. Comparison of the predicted BMDL5 for lasiocarpine and riddelliine between Chinese and Caucasian subjects showed that for Chinese subjects, the predicted BMDL5 for lasiocarpine was 2.0-fold higher and for riddelliine 5.0-fold higher than for Caucasians, suggesting that Chinese subjects might be less sensitive towards acute hepatotoxicity of lasiocarpine and riddelliine. This is mainly due to the differences in bioactivation of the parent compound, resulting in less bioactivation for both compounds at similar dose levels in average Chinese compared to average Caucasian subjects, and occurs in spite of less efficient clearance in Chinese as compared to Caucasians. In the present study, human hepatocytes used to study the in vitro cytotoxicity of lasiocarpine and riddelliine were derived from Caucasian subjects. Since human hepatocytes derived from Chinese subjects are not available, in vitro cytotoxicity for Chinese hepatocytes was defined by read-across from the Caucasian liver hepatocytes taking into account the difference in bioactivation between Chinese and Caucasian liver microsomes, as reflected by 7-GS-DHP formation in in vitro incubations. In the present study, we used GSH as a trapping agent to estimate the amount of reactive metabolites formed in liver microsomal incubations which is in line with the method described previously (Tamta et al. 2012). It has been reported that dehydro-PAs react with GSH forming there metabolites, 7-GS-DHP, 9-GS-DHP and 7,9-di-GSH-DHP, of which 7-GS-DHP is the major metabolite formed in vivo and in vitro (Chen et al. 2016; Lame et al. 1990; Lin et al. 1998; Reed et al. 1992; Tamta et al. 2012), whereas 7,9-di-GS-DHP is only formed in vitro (Lin et al. 1998; Reed et al. 1992; Tamta et al. 2012). Other factors influencing the dynamics of liver toxicity caused by PAs, for example, the relative potential for repair, cannot be taken into account in this way. Nevertheless, the approach now taken provides an adequate first approach to study the potential ethnic differences in the toxicokinetic process of PA-induced liver toxicity. The ethnic differences in metabolic clearance of lasiocarpine and riddelliine determined by substrate depletion using liver microsomess for both populations was 2- to 4-fold, with clearance by the average Caucasian being more efficient. The difference in efficiency for formation of bioactive metabolites for both compounds by the Chinese and Caucasian incubations amounted to 7- to 8-fold, the value for the average Caucasian being highest. It has been reported that besides CYP 450 enzymes, flavin-containing monooxygenases (FMO) and carboxylesterases are considered to be involved in detoxification pathways as shown in Fig. 1 (Fu et al. 2004). FMO was found to be partly involved in the N-oxide formation and carboxylesterases are involved in hydrolysis of the ester groups of PAs leading to the formation of necine base and necic acid moieties, which is considered to be the major detoxification pathway (Fu et al. 2004). Currently, two predominant carboxylesterases (CES) enzymes have been identified in human, i.e. CES 1 and CES 2 (Wang et al. 2018). A recent review reported that ethnic differences in carboxylesterases enzymes activity may be present due to single nucleotide polymorphisms (SNPs). For instance, CES 1 variants G1420E and D260fs, which are two important functional SNPs in Caucasian populations, showed reduced esterase activity in vitro, while these two variants were not found in the Asian populations (Cha et al. 2014; Wang et al. 2018). However, detailed studies of assessing ethnic differences in carboxylesterases activity are still lacking. It is also of interest to note that in toxicological risk assessment, a default uncertainty factor of 10 is used to account for inter-individual variation, which can be divided into a factor 3.16 for kinetic and 3.16 for dynamic differences (WHO 1999). The ethnic human differences in predicted PoDs of lasiocarpine and riddelliine between Chinese and Caucasian subjects, were estimated to be 1.7-and 5.0-fold respectively, and are thus in line with the default value of 3.16 for inter-individual kinetic differences. However, various studies report much higher than 2- to 5-fold inter-individual variability in the expression of the major hepatic CYP enzyme (CYP 3A4) involved in PA metabolism, ranging up to 100-fold (Westlind-Johnsson et al. 2003), or even up to 400-fold when taking illness, inhibition, and induction-related interactions into account (Galetin et al. 2004; Wilkinson 2005). Another study reported that inter-individual variation in the expression of CYP 3A4 varies 40–50-fold (Ingelman-Sundberg 2004). Therefore, the human inter-individual variation in kinetics is likely to be larger than the default value of 3.16. In a next step, to actually quantify inter-individual human variation in sensitivity to acute liver toxicity of lasiocarpine and riddelliine, the PBK model of the present study should be developed for individual subjects and combined with Monte Carlo modelling to predict hepatotoxicity within the human population. This Monte Carlo modelling should especially consider the variability in the PBK model parameters shown in the sensitivity analysis to influence the model predictions to the largest extent including the Ka and the kinetic parameters for metabolic clearance in the liver. Given that the ultimate critical effect of lasiocarpine and riddelliine is not only acute hepatotoxicity but also genotoxicity and subsequently, carcinogenic transformation, it may also be of interest to extent the current PBK model to a physiologically based dynamic (PBD) model able to predict in vivo DNA binding as previously done for estragole (Paini et al. 2010). This would require the definition of an in vitro concentration response curve for DNA adduct formation in the primary hepatocytes, which can subsequently be translated to an in vivo dose–response curve for DNA adduct formation. According to the study of Xia et al. (2013), DNA adduct formation is a common biological biomarker of PA-induced tumorigenicity in rats. Previous studies reported that the metabolism of riddelliine by human liver microsomes resulted in a similar metabolic pattern and DNA adduct profile to those formed in the rat liver, suggesting that the mode of action of PAs studied in experimental rodents is highly relevant to humans (Xia et al. 2003; Zhao et al. 2012). The current PBK model could also translate in vitro concentration–response curves for DNA adduct formation in human liver cells to in vivo dose–response curves for DNA adduct formation in the liver of human. In conclusion, the present study shows that PBK modelling-based reverse dosimetry can identify the differences in inter-species and inter-ethnic human differences in liver toxicity of lasiocarpine and riddelliine. The species-dependent variation in hepatotoxicity defined by the BMDL5 (average PoDs of Caucasians and Chinese) is up to 2.0-fold for lasiocarpine and 8.2-fold for riddelliine, with humans being more susceptible to lasiocarpine and riddelliine-induced liver toxicity than rat. The inter-ethnic human difference between average Chinese and average Caucasian subjects was estimated to be 2.0-fold for lasiocarpine and 5.0-fold for riddelliine, with the average Caucasian being more sensitive towards the acute liver toxicity of lasiocarpine and riddelliine, mainly due to more efficient reactive metabolite formation. Altogether, the present study shows proof-of-principle for a method to predict inter-species and inter-ethnic differences in in vivo liver toxicity for PAs by an alternative testing strategy integrating in vitro cytotoxicity assays with PBK modelling-based reverse dosimetry. This work was funded by a grant from the China Scholarship Council (no. 201507720019 to NING JIA and no. 201508650023 to CHEN LU).